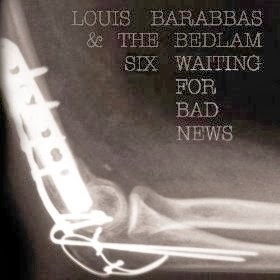 New & awesome: Louis Barrabas & the Bedlam Six "Waiting For Bad News"
Love this new song from Manchester's Louis Barabbas & the Bedlam Six titled "Waiting For Bad News." Barabbas is a former mime and street sweeper who is quite obviously a talented musician and he's also co-owner of indie label Debt Records. Some of Barabbas' previous recordings draw comparisons to Tom Waits (growling Waits-esque vocals), though the new single "Waiting For Bad News" is a bit of a departure from past material, both musically and vocally. Check out the video for "Waiting For Bad News" below. The more you listen, the more it infects you. A full length album from Louis Barrabas & the Bedlam Six titled Youth is expected out soon (details to be announced shortly). In the meantime, download the digital single for "Waiting For Bad News" on Amazon. For more on Louis Barrabas & the Bedlam Six, visit the official site here.